In the historical heart of the Medina, between the Medersa Ben Youssef and the Marrakech Museum, close to the Souks and the famous Jemâa el-Fna place, this vast and luxurious renovated house dated from the 17th century will make you enjoy unforgettable moments of authenticity and refinement. This Riad of charm offers large and comfortable rooms and suites combining tradition and modernity. You will relax in the SPA area of the Riad comprising Hammam and Massage rooms, or in the three splash pools in the courtyard and on the terrace. The lovers of Moroccan cuisine will enjoy traditional dishes of quality served in privatized and intimate areas. You will enjoy the fairy atmosphere of Marrakech on one of the largest terraces of the Medina (650 sqm), planted with trees and flowers, at the sun rising or sunset, with a view on the Atlas, ideal for your sunbaths and your private events. 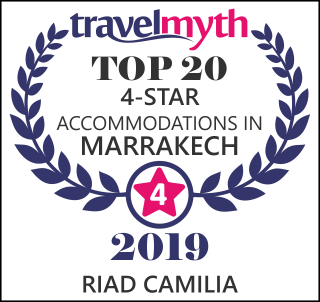 Riad Camilia offers unique events, multiplying each of your senses by giving them a special breath.